I got Alan his first Autism t-shirt when he was pretty little. We were going on vacation and I wanted a shirt for him to wear when we were in unfamiliar territory that identified him as having autism so that people could understand why he was acting the way he was acting! We were so happy with people's reactions, that we came home and ordered 3 or 4 more. We've added several a couple times of year since then and prefer to dress him in them on the weekends. We just got a new batch last week and I can't figure out my favorite. I love them all! I have autism and I am a good boy. My mom and dad are doing the best they can. Friendly smiles are appreciated, parenting advice is NOT. I'm not a brat, my genes just don't fit. I have autism. Thanks for being patient with me. 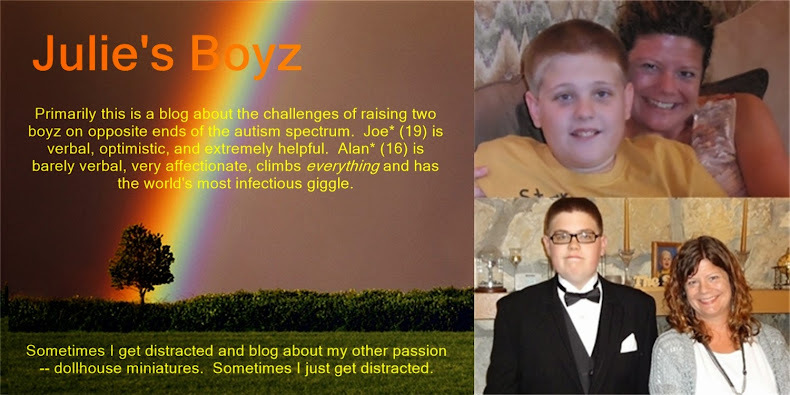 Autism: Seeing the world from a different angle. Staring at me will not cure my autism. Just because I can't talk doesn't mean I don't understand. I have autism. Please be nice to my mom. Warning: Autism meltdown probability high. I'm not rude, hyper or spoiled. I'm autistic. Stare if you must. I'm ignoring you anyway. I have autism and I'm ignoring you. Autism: Being different can be a good thing. I have autism and I think you are weird, too. Keep staring and it might cure my autism. Then we can work on YOUR social skills. Thank goodness for a sense of humor! No he can't read. Does that make me a bad mom? He has quite the attitude for a non-verbal kiddo, though. I sure can see him saying all these things. No, it doesn't make you bad mom and there is no need to justify how you dress your kids. I think that this is a great way to help bring understanding and awareness to a disorder that many people don't understand. Good for you and your son! :-) I just panicked for a minute because it never occurred to me to wonder if he should have a say in this. I love this! You know I never thought of dressing my son in autism t-shirts but it does make sense and it might help people understand. Thanks for sharing. Love these. My favorite is a tie....but I think I love one of his new ones: Not being able to speak is not the same as having nothing to say! And Lizzie just likes making us panic :) I am sure he would wear the shirts if he had an opinion. If nothing else than to welcome people to the neighborhood! Believe it or not I have never seen Autism T-shirts?? ?I guess because we home school? Or maybe because we are not out in public as much as other families. But I love them. Thanks for sharing. Blessings! Oh my - I think my favorites are the one about parenting advice not being welcome. Stare if you must - I'm ignoring you anyway (ha!) and the final one about then we can work on YOUR social skills! Hehe! I need to get some of these!